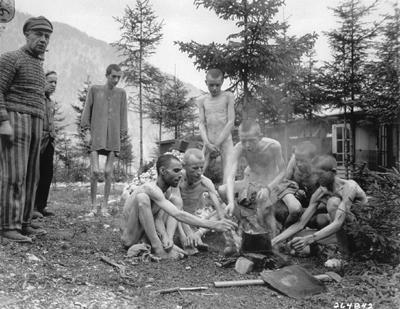 Holocaust Survivors: Photo Gallery - "Survivors Prepare A Meal"
Units of the 80th Division overran the large Nazi prison camp in Ebensee, Austria, a sub-camp of Mauthausen. They liberated about 60,000 prisoners of 25 different nationalities, all in various stages of starvation. Here, some of the prisoners prepare a meal over an open fire in the camp.